Cast for Fiddler on the Roof, Jr.
Papas: Daida Herrera-Garcia, Katie Gooch, Dylan Hoyt, Kindy Lloyd, Lane Masters, Emilee Morris, Laura Shaffer-Drennan. Mamas: Anna Auwarter, Morgan Dry, Capri’Ona Fountian, Victoria Fugaro, Miriam Gleeson, Elizabeth Kabsuke, Danielle Kelly, Erin Kelly, Abbie Smith. Daughters: Lucita Gleeson, Kiera Hayden, Ava Herron, Kyra Loyd, Abriana Lynch, Sarah Kasubke, Ella Robertson, Jyllian Whitworth. Cast for Dinosaurs Before Dark, Kids! Avery Adams, Jacob Douglas, Ella Foy, Lucita Gleeson, Riley Hanley, Tucker Herron, Aubrey Lee, Claire Montague, Autumn Moore, Jenna Schnipper, Skylar Shaw, Rebecca Stanford, Miley Thurber, Maya Wieburg, Owen Wilburn, Jyllian Whitworth, Aidan Wilson, Landon Whitworth, Sunny Wright, Jordyn Wyman, Sydney Wyman, Taylor Wyman. I am very excited to work with all of you - especially those for whom this will be their first Presser production. I think this cast has the potential to bring something really special to our community. Our first rehearsal will be January 7th at 6:30 p.m. Please mark it on your calendar and make every effort to be there. Our regular rehearsal schedule will begin the following week. On Mondays and Thursdays we will focus on the lead roles, and on Tuesdays we will focus on the supporting roles. We will be putting a premium on getting lines memorized early so we can later turn our attention to the finer details of the performances you will craft. With that in mind, I hope you will take some time over the holidays to start memorizing your part. 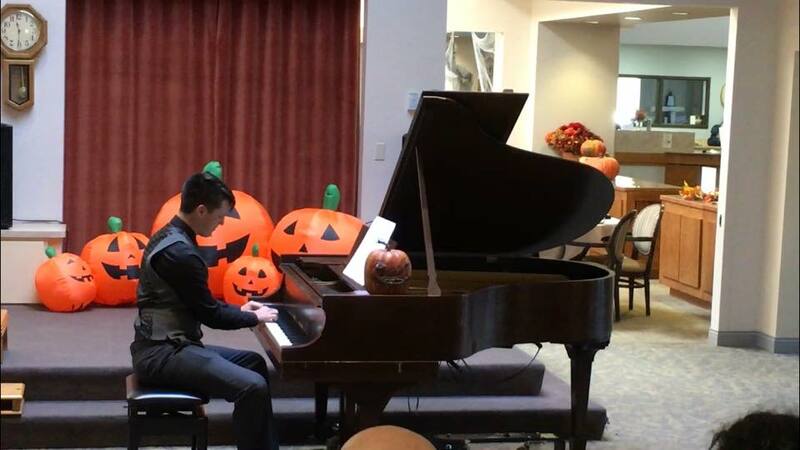 This past weekend Presser’s piano instructor Yukiyo Lake took her students to a retirement home for a Halloween Piano Recital! Twenty nonprofit arts education organizations have been selected to participate in the National Guild for Community Arts Education’s Catalyzing Creative Aging Program. This multi-phase initiative, provided in partnership with Lifetime Arts, is designed to support the establishment of new, professionally led arts education programs for older adults that increase social engagement and mastery of one or more art forms. Research shows that professionally led, arts education for older adults fosters positive aging. “Now in its second year, the Catalyzing Creative Aging Program is proving to be a highly successful vehicle for broadening access to lifelong learning in the arts,” said Jonathan Herman, executive director of the National Guild. “By building our members’ capacity to launch these programs, we are inspiring community organizations to serve more older adults and to develop innovative new models of service. We are proud to partner with Lifetime Arts, a nationally recognized leader in designing and disseminating model creative aging programs for active older adults, to catalyze this growth and innovation across the nation." Through this program Lifetime Arts will provide training and technical assistance for eight months via a series of workshops, webinars, and video consultations designed to increase each organization’s capacity to serve older adults through skill-based, participatory arts programs. Ten of the participating organizations will be selected — through a separate competitive application process — to receive seed grants of up to $7,000 from the National Guild to implement new creative aging programs beginning in fall 2019. Raise public awareness about the benefits of creative aging programs. The 2018-19 Catalyzing Creative Aging Program is made possible with support from Aroha Philanthropies and the NAMM Foundation. Thank you to all who auditioned. This was not an easy task to do. Please don't be discouraged if you did not get a part, there are many more productions to come. Due to time limitations and construction, Presser and Mexico Ledger will take a 1 year hiatus from the April Poetry Competition. Come Back and Keep WRITING for 2018!!! !